For a while now, actually, but I’m doing an extraordinarily bad job of keeping this blog updated…so I’ll play catch-up with some kitchen photos as we inch closer to finally wrapping this thing up! Here’s what we accomplished in December (along with some other fun but less photogenic things like electrical and plumbing work). 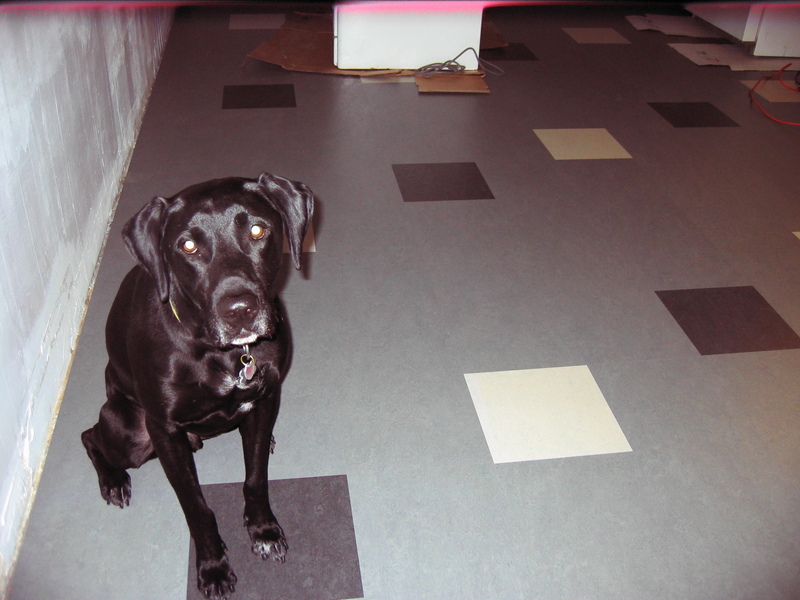 This is our shiny new Marmoleum Click tile from Anderson Carpet & Linoleum on Broadway, installed in December by D. (with a little bit of help from me!) The Labradane is a fan, or at least he became one once he got used to slip-sliding on it! He’s perfected the art of stopping mid-kitchen and sliding the rest of the way to the back door—but remarkably, two months later this stuff has yet to show many scratches to speak of. So that gets it a thumbs up from me! I have had absolutely zero time to write anything (or even think about writing anything!) this fall, with a bad combination of kitchen craziness kicking off just as things at work suddenly ramped up quickly. And while I had every intention of carefully documenting our kitchen remodel, I discovered on the morning of demo that we didn’t even have a working camera in the house—aaah! I am still trying to carve out some time to post more regularly, but right now that looks iffy through the end of the year. Fingers crossed for things calming down a bit in 2011! However, I did find a working camera, and will be better documenting it moving forward and writing some small bits on our kitchen as we finish chunks (but not in the midst of the work, out of respect for the many contractors who are hard at work on our kitchen). We’re also having lots of tasty meals out (and at our friends’ and neighbors’ places–thanks guys!) so with luck there will be a few more restaurant reviews coming soon, too. So, for now, I leave you with some terrible iPhone before and during photos of our kitchen. We had the crew from the Reuse People in East Oakland come out to deconstruct our kitchen, so they saved what they could and took it off to to be, hopefully, reused. See ya, Wall o' Cabinets! 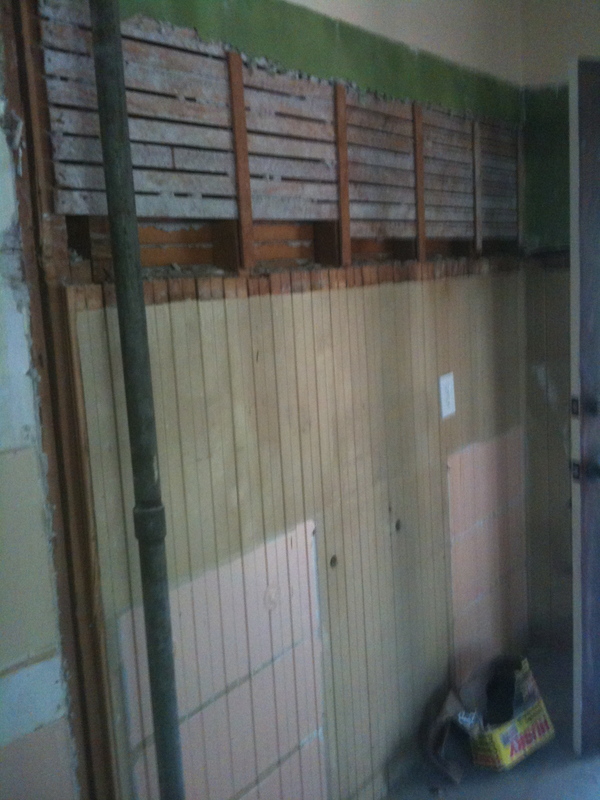 …and here’s what it looked like when they finished pulling off the cabinets and the old stove flue. Yeah, who needs walls when you’ve got some plaster and putty to stick things on! This is the old laundry porch, which had been integrated into the breakfast room in the 1940s. Turns out the wall behind the cabinets had never been plastered—it still had the original beadboard, and in that remodel they just covered it up with our breakfast room built-in sideboard. 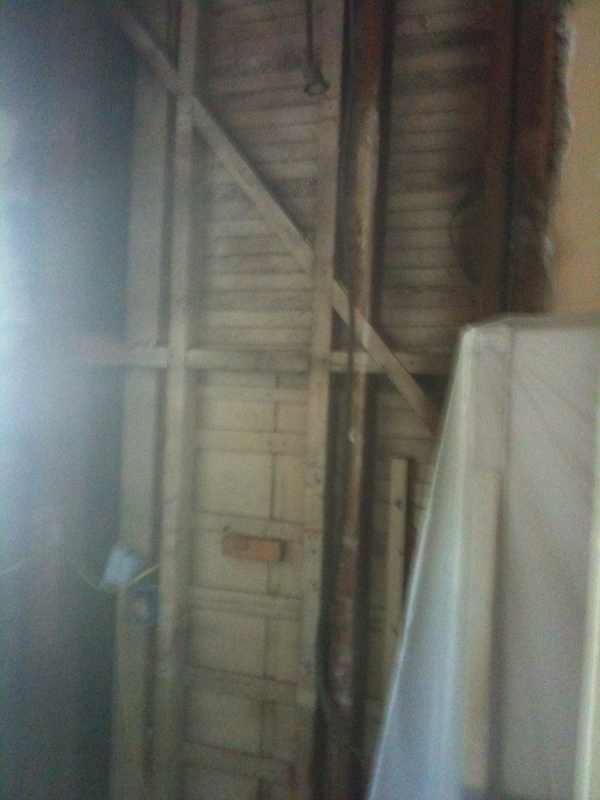 We haven’t decided whether to take the beadboard off and plaster it or just leave it along (though leaving it be is complicated by the fact that the old plumbing hookups stick out of it, and still need to be removed). The old laundry sink vent was, happily, our only demo surprise—it wasn’t connected to anything, so it just got sawed off and hauled away. 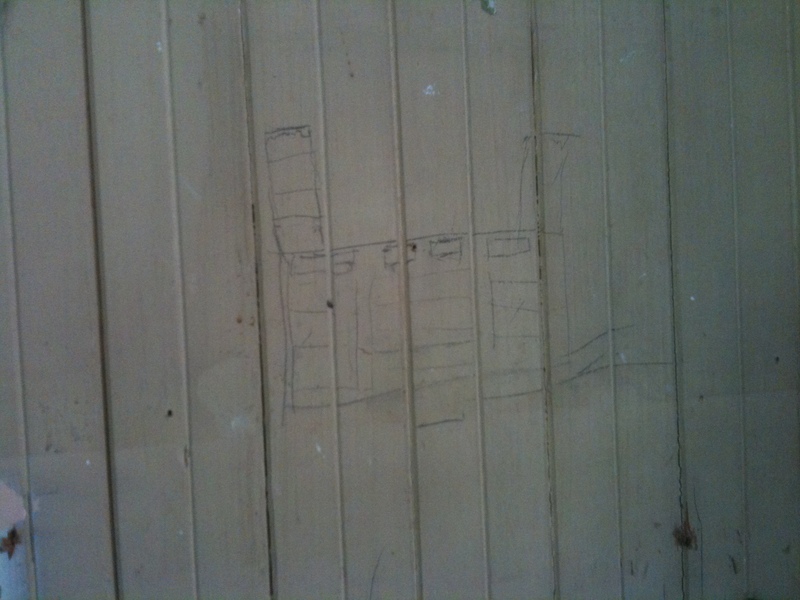 We discovered this little drawing behind the built-in. Someone had apparently been sketching out the plan before they started! Because we didn’t do the demo ourselves, we probably missed out on some other fun historical finds (and D. was bummed to discover, a week later when we finally took a look at the roof, that the demo crew accidentally trashed the antique chimney cap for the stove flue, which we’d asked to keep. *sigh*) We did find snippets of a newspaper; the Penney’s ad had no date, but probably was from the 1939 remodel based on other examples we could find online with similar styles and prices. 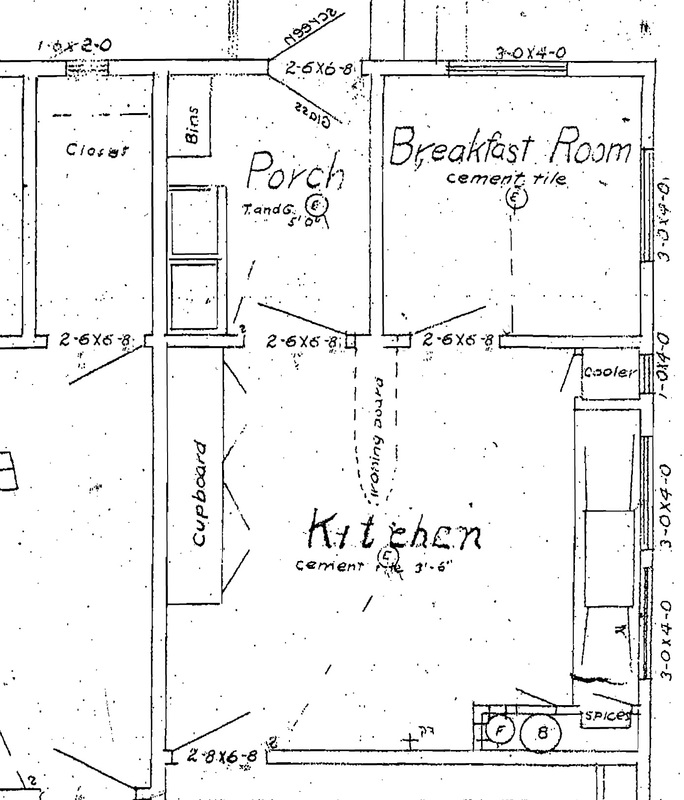 One of the fun things about living in a 1915 bungalow is finding other similar homes and looking at what others have done with the layout over the years—and boy, are there a lot of them! 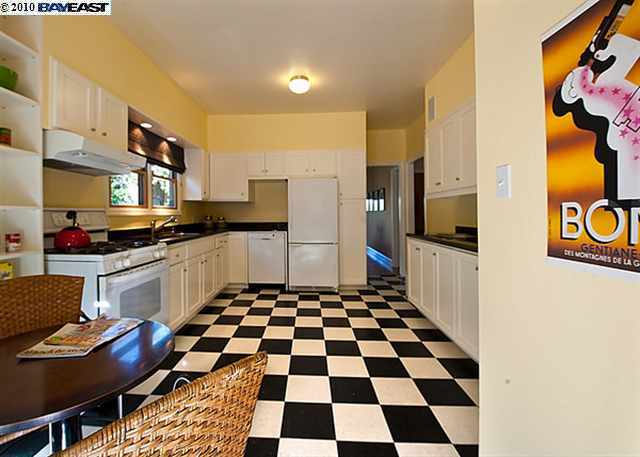 As we started thinking about the kitchen two years ago, one of the most interesting things I did was to start browsing the MLS listings to take a look at other bungalow kitchens. In Oakland, it’s surprisingly easy to find them, too. While our house isn’t a kit house (that we know of) and we have yet to find a twin other than its actual next-door twin, there are still a lot of strikingly similar variations on the layout. 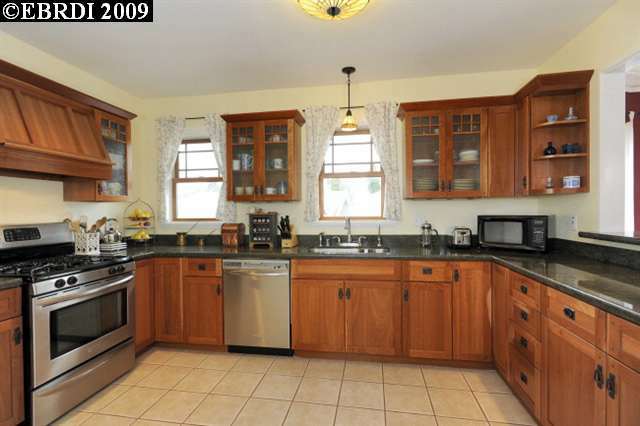 If I set search parameters to include houses between 1000 and 1500 square feet that were built between 1900 and 1930, it’s a pretty good bet that I’ll turn up at least one or two similar kitchens on any given day. And if I only look at the two-bedroom houses built between 1914 and 1925, my odds quadruple. Our kitchen, prettied up and staged for sale. Look how clean it is! And here’s what some other folks have done with roughly our layout. 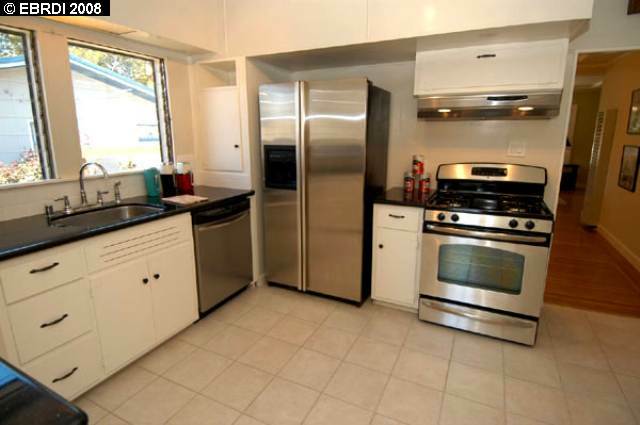 Interestingly, almost all of these kitchens also break the work triangle, with the exception of a few that either never had or have removed their coolers and have the refrigerator located there. 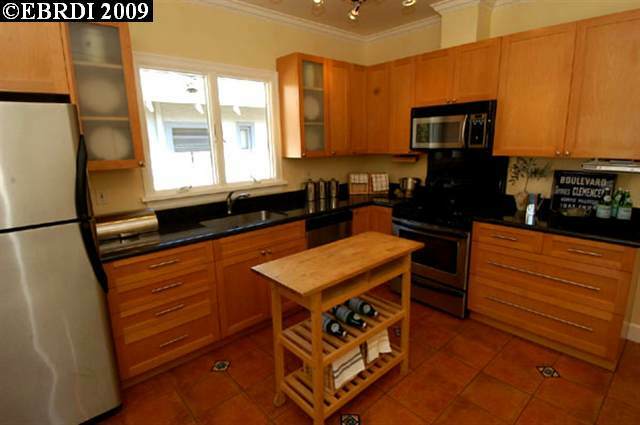 This kitchen sacrifices corner counter for a longer run to the right of the stove. This was helpful to get a sense of what counters on the right side might look like. It also convinced me that we don't want our refrigerator where this one is, since it creates too much of a wall as you come into the kitchen. 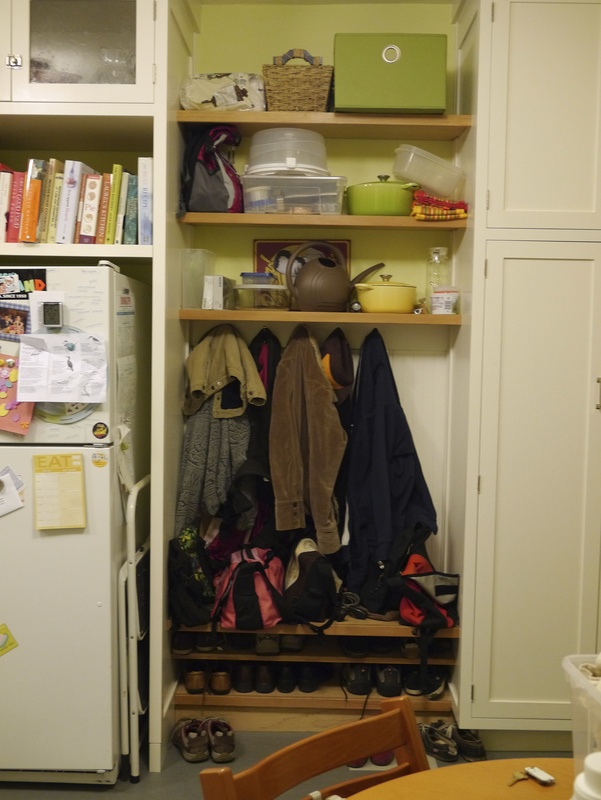 This is roughly what our corner will look like, except we may have shelves instead of an upper there, and our drawer banks will be a bit bigger. 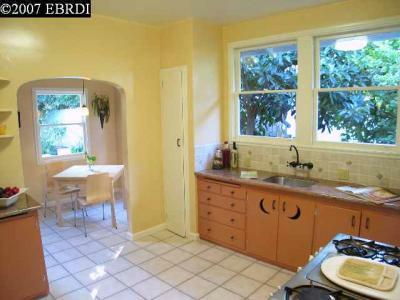 This is the same kitchen, but gives a glimpse of the breakfast nook. 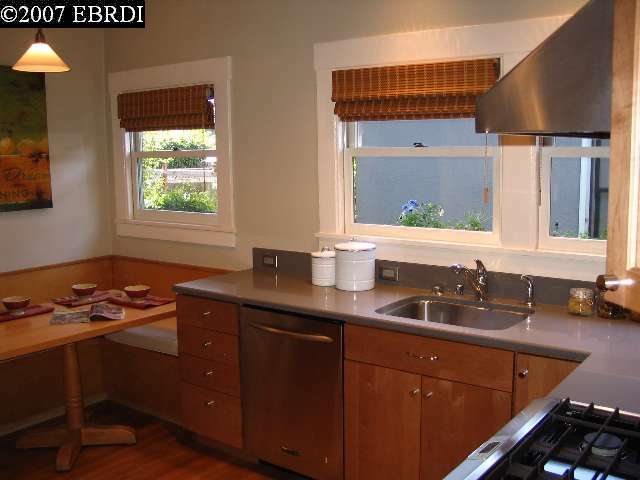 This is one model I like for ours, though our kitchen is a bit longer than theirs, so it would be a roomier layout. Another approach to the fridge dilemma. 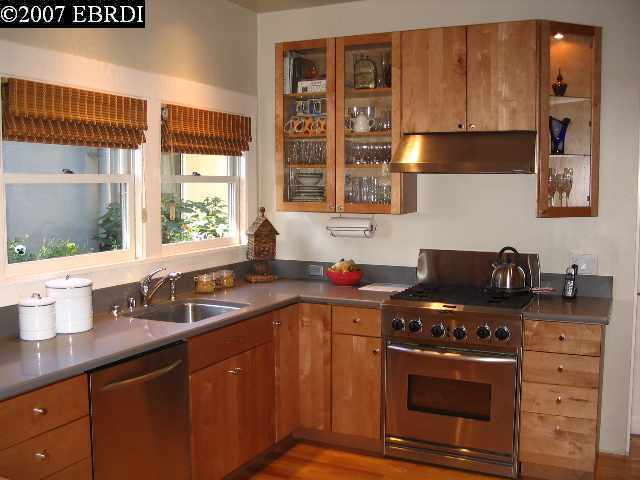 We could do this, but I don't like the resulting counter space configuration much. They also seem to have a peninsula to make a "U" shape, something a couple of the designers we talked with suggested for our space. This is one of my favorite kitchens, though it's not quite the same as ours (but quite similar if you look at the full layout). You can't tell in this photo, but the door is just to your right, and there's actually a cut-through to the dining room over the counter on the right. We would need to sacrifice the cooler to get a U like this, though. Yet another approach to the corner. 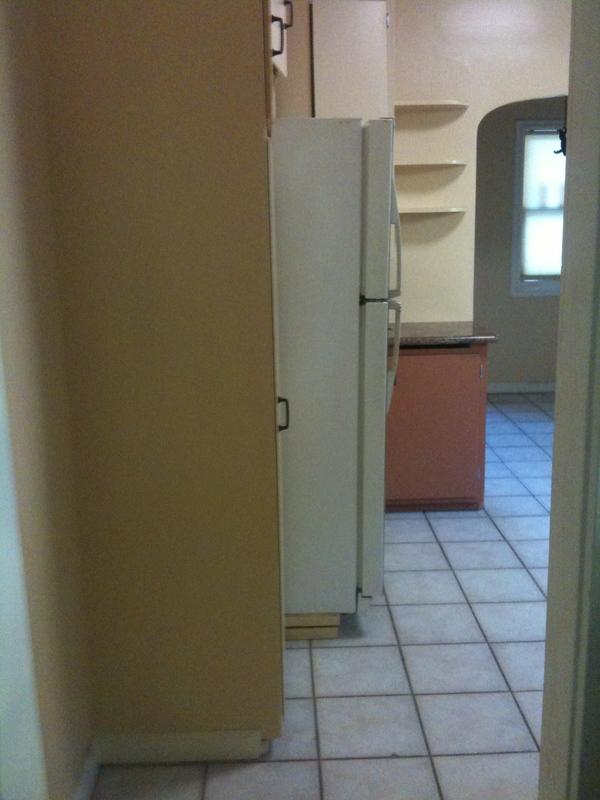 Not sure where the fridge is in this kitchen, as the photos don't include it. This kitchen pushes the chimney into the corner, which is pretty common (and much smarter than ours, where it's dropped into the center of the room!) They also wrapped around a peninsula, and seem to still have their cooler, too. This kitchen is either a wee bit wider than ours or laid out differently as far as the doors go, since we can't quite get a peninsula in while keeping a 42" aisle against the wall. Ah, well. Bet you thought we’d abandoned this project, huh. It does feel a little like that, since I’ve had to redirect energy to several other big projects this spring….but we’re still hoping for a summer start on our renovation. My original goal was to be in our new kitchen in time for our third anniversary of being in the house in September (which is now looking a little on the optimistic side, but hey). We do finally have a close-to-final plan, though. This has been through a lot of iterations, and as we started to get bids on the structural work, we realized we’d bitten off a little more than we could chew with our original visions of pocket doors and grand entrances. 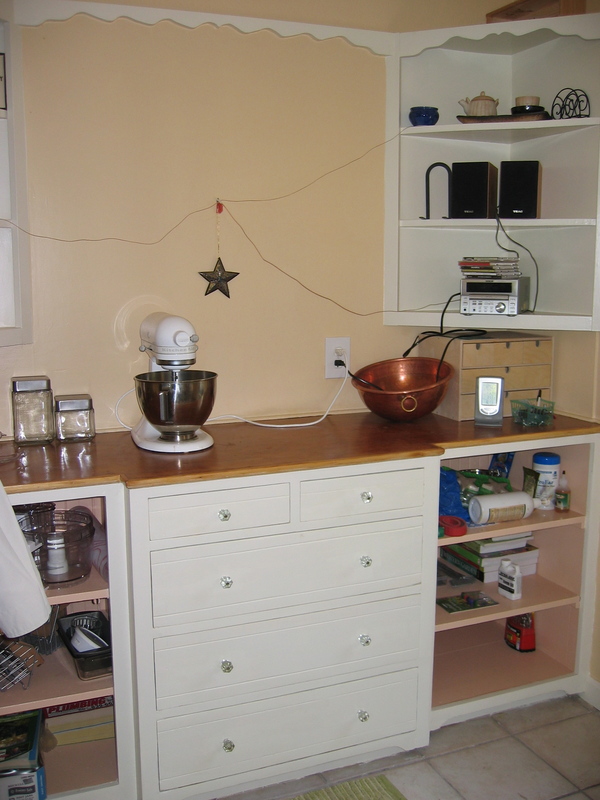 So instead, we wound up with Kitchen 2.0, the new-and-improved version of what we already have. And here’s our new plan. Update: Here’s a diagram that includes the hypothetical furniture, too (not to mention a few tweaks, since this is a work in progress). It’s not so different, but it fixes a lot of the critical flaws. It also creates a few new ones, namely breaking the work triangle rule by placing appliances a little too far apart and across a major corridor. We haven’t figured out a good way to avoid this, though, short of some serious structural work that would blow our pretty modest budget. The vast empty space will house some sort of breakfast table, plus a little bench and space for shoes, coats, and dog-related paraphernalia. I’m also still fiddling with the refrigerator wall to try to consolidate that cabinetry without completely blocking the view from the doorway to the backyard…we’ll see. Anyway, the next step is to refine the plan a bit more as we try to pick out cabinets that will respect the style of the house and also respect our meager post-wedding bank account…we’re inching closer, but still not quite there yet! 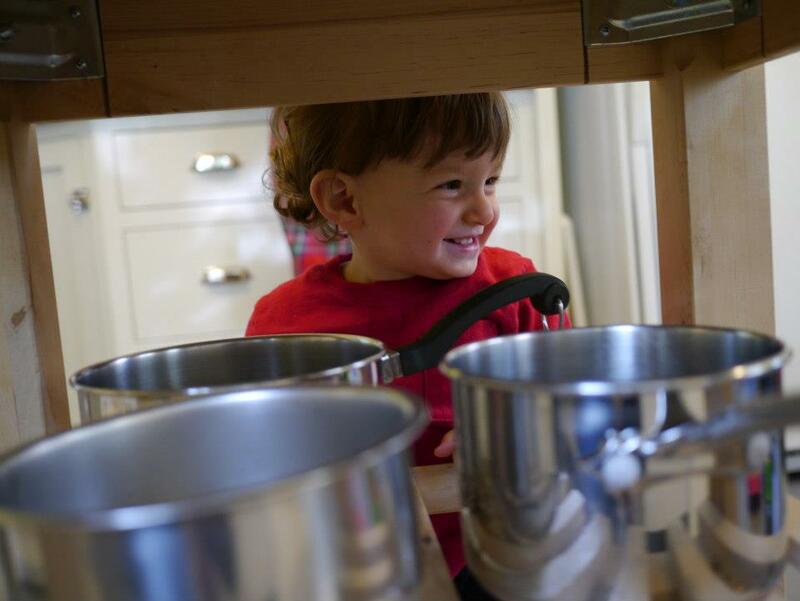 Kitchen Chronicles: A little Oaktown history! Yeah, I know it’s been weeks since I’ve had anything to say about our kitchen remodel. This isn’t because it’s fallen to the wayside—in fact, it’s chugging along nicely, on track for a post-wedding July start—but because I’ve had absolutely no time to sit down and write much of anything. Soon, though! In the meantime, here’s a little fun history I ran into along the way. 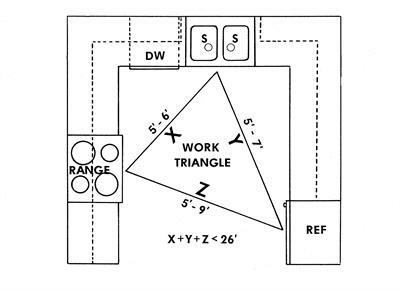 So what’s a work triangle? 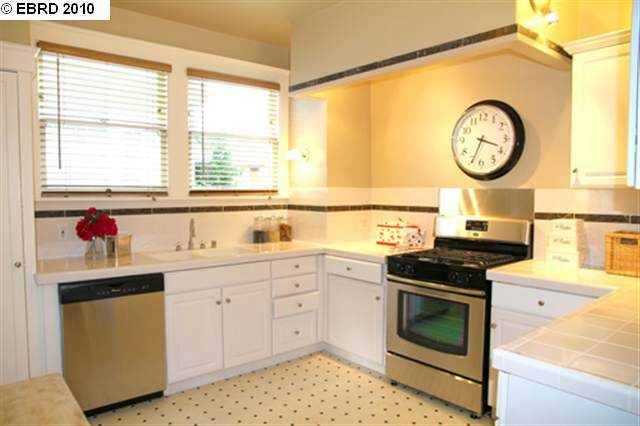 If you can get all of that accomplished, you’ll have a more efficient kitchen. 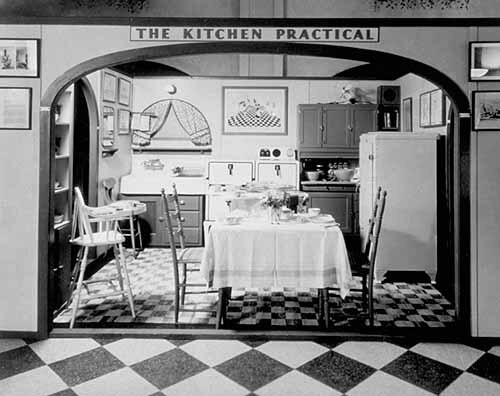 It should be noted, of course, that all of these dimensions were refined back in the 1930s and 1940s, when kitchens were a whole lot smaller and it was pretty simple to accomplish this. 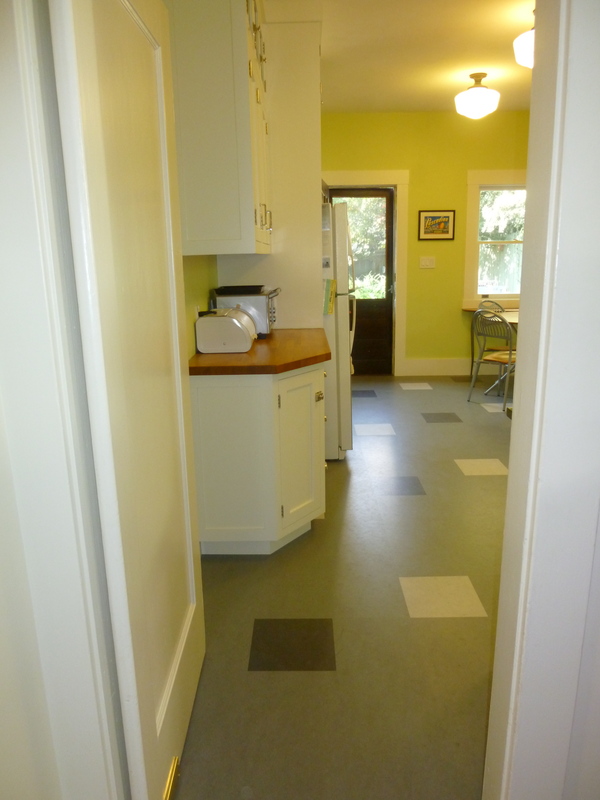 (In fact, our current kitchen meets all but the last work triangle requirement!) Back then, the concept of maximizing efficiency in the workplace was pretty novel—before the late nineteenth century, designers hadn’t thought about this as scientifically. Enter consumer science and industrial psychology! And who’s Lillian Moller Gilbreth? Lillian Gilbreth is probably best known these days as the matriarch of the Gilbreth family, whose adventures were chronicled in the books (and later two rounds of movies) Cheaper by the Dozen and Belles on Their Toes. But while her husband Frank’s work in scientific management and efficiency studies was groundbreaking, Lillian’s work on motion studies, time management, fatigue, and stress—and especially, on work issues affecting women—was equally critical to the development of modern domestic science and ergonomics. Lillian was born Lillie Evelyn Moller, and grew up on our street a few blocks west in a house that was sadly torn down in the 1940s to build part of what is now the Summit Medical Center campus. (She changed her name to the more formal “Lillian” later in life.) At the time, “Academy Hill,” as Pill Hill was originally known, was prime real estate in Oakland, with a number of sizable mansions in the area. The Mollers lived in a large home there with two Japanese servants. During the time Delger lived in Uptown, he named the streets on his land Frederick Street (now 19th), William Street (still there! ), and Delger Street (20th). Gotta love creativity. (If you’ve ever wondered why many of the numbered streets in downtown Oakland are only in a kinda-sorta grid, it’s because the numbering was done after the fact; in the city’s earliest stages of development, many of the streets were named for and platted by the landowners, but in later years as the city grew, a numbering system was superimposed. In contrast, the numbered avenues in East Oakland were planned before much of that development went in.) Delger and his family are now buried in an ornate mausoleum in Mountain View Cemetery at the end of Piedmont. Lillie, the oldest of the Moller children (excepting an older sister who died as an infant), was first home-schooled, and briefly attended Miss Snell’s Female Seminary before transferring to public elementary school in Oakland. (I haven’t been able to figure out which one; the only clue is that after the Moller family moved away from Pill Hill, Lillie had to take the streetcar to school. But since I’m not sure where they moved to and many of the streetcar lines converged on Broadway at that point, that doesn’t help much!) From there, she attended Oakland High School—Oakland Tech had not yet opened—and overlapped for a year there with author Jack London. Finally, following graduation, she went on to UC Berkeley, becoming one of the first women to pursue graduate education there. While Lillian’s Oakland story ends there—she moved out east, married Frank Gilbreth, and settled there, only returning to California for visits after that point—she went on to do all sorts of work, pioneering the new field of industrial engineering and helping to lay the groundwork for modern industrial engineering. But that’s a story for another day! Anyway, none of this has helped advance our kitchen project much, but it’s been fun to wade through some of the history on this. If I get a chance (that would be this summer at the earliest!) I’ll pull it together into something a bit more comprehensive with some better pictures. Still, it’s a cool little window into our neighborhood’s past. And the 2010 house resolutions! Last week I gave the final rundown on the 2009 house resolutions, which means it’s time for (da-da-daaaa!) the 2010 list. This year’s projects are mostly short and sweet, because we’re tackling one HUGE project and also getting married in June, so there will be more than enough things to occupy us. Still, there are some projects here I’m super excited about! 1. A DISHWASHER. 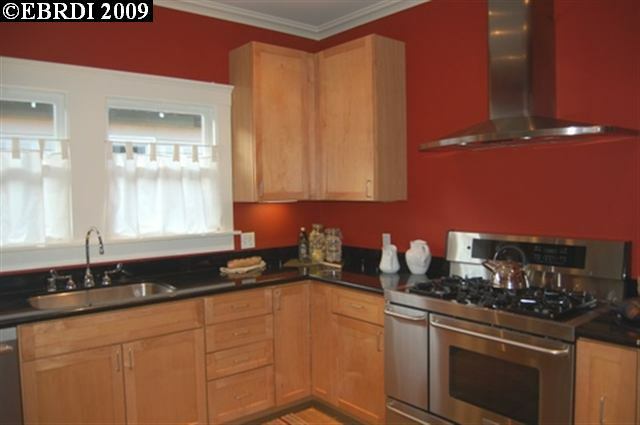 Well, a whole new kitchen, actually. This a carryover from last year’s list. It’s our one huge gigantic project for this year after a year off from contractors—we did the electrical and seismic work back in 2008—and since we’re trying to do at least some of it ourselves, I’m expecting it to consume a lot of time. 2. HONEYBEES. Thanks to a little bit of a kick in the pants from my sister in the form of a gift certificate to Her Majesty’s Secret Beekeeper in San Francisco (thanks B!! ), this jumped up our list a bit, and I can’t wait to get started on it! But first, I need to learn a little bit more about what I’m doing here—so look for more in the months to come. 6. GARAGE SHELVES AND BIKE RACKS. We’ve needed these forever, but it’s just never a very high priority project…maybe putting it on the resolutions list will make it one!